Travel Bites Autumn 2010 informs as to what’s coming up, what’s going on, and what’s to see around Australia. 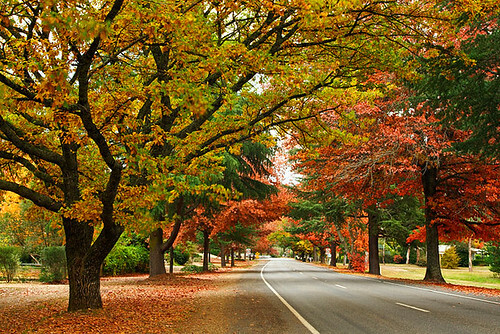 From a high country autumn festival, to a snappy time with some crocs – there’s something for everyone. Seventeen Seventy – Commemorating the visit of the Endeavour and landing of Lieutenant James Cook on 24 May 1770, the 18th Annual Captain Cook 1770 Festival will be held Friday 21 May – Sunday 23 May, 2010. Highlights include a re-enactment of Cook’s landing, street parade, live music and fireworks. Date and time: Wednesday 20 January 2010. 12:42pm. Date and time: Tuesday 11 August, 2009. 5:48pm. Travel photography involves more than photos of sunsets, landscapes and architecture, but most photographers seem hesitant to photograph people they don’t know. People are an integral part of a city or town’s heartbeat, and people are inquisitive by nature and enjoy looking at photos of people. Major outdoor events in cities and towns are prime opportunities for photographers to undertake travel photography as it’s relatively easy to blend in with large crowds. With some research under your belt, and suitable equipment for the task, consider photographing an Anzac Day march and ceremony. 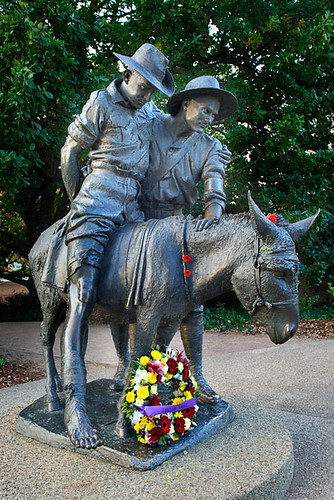 On Anzac Day in recent years, I’ve been away from home undertaking travel photography in VIC, ACT and NSW. The primary purpose was to photograph the splendid autumn colours on display; however my mind was fixed on expanding my photographic library. 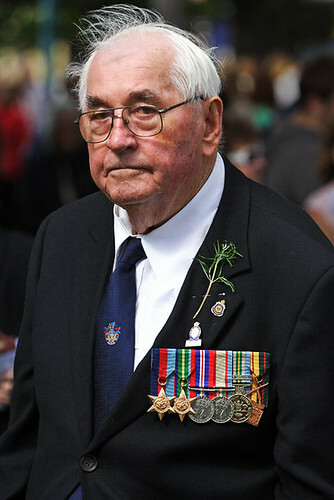 In 2009, I was visiting Kiama in NSW and decided to photograph the local Anzac Day march and ceremony. Being from out of town, I had no idea where the march would start and finish. I headed out early for a coffee at a local café and began chatting to the locals so I could ascertain where the march would start and finish. 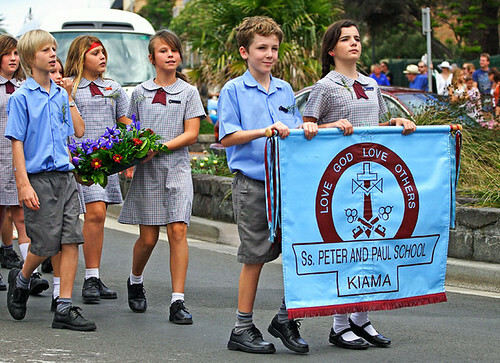 The march was scheduled to commence at the Kiama Town Hall, head north-east along Manning Street, turn left at the roundabout into Terralong Street, and proceed to the imposing Memorial Arch at the intersection of Collins and Terralong Streets. I surveyed the streets for an hour-and-a-half before the march searching for positions which would avoid distracting backgrounds in my photographs. Before the march commenced, the clouds rolled in and lighting conditions became favourable as harsh shadows disappeared from people’s faces. 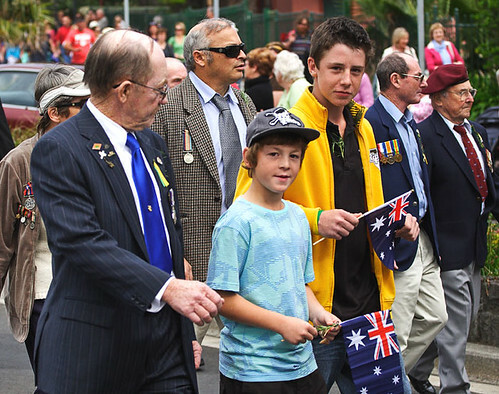 With youngsters waving Australian flags, school children carrying banners, teenagers and family members wearing medals, older vets being pushed in wheelchairs, and proud returned service men and women marching, there were numerous opportunities to take photos. 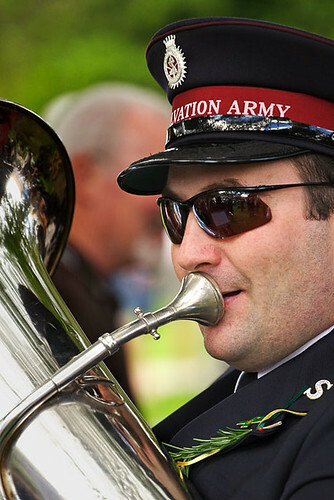 The Salvation Army Band was in attendance, and this later provided opportunities for close-up shots of musicians playing instruments. With a broad age range of people marching, and later congregated for the official ceremony, I believe it was an interesting event to photograph. 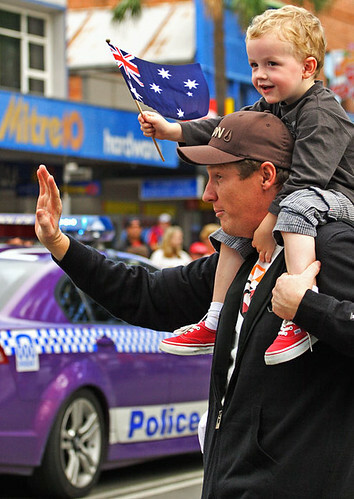 I trust the following tips inspire you to photograph on Anzac Day. Children who have a look of excitement on their faces tend to be good photographic subjects in a crowd. 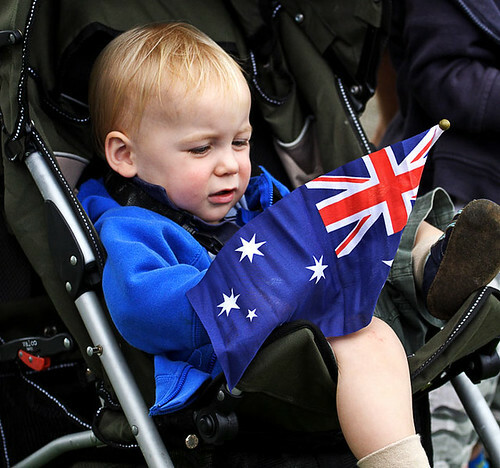 If you see a child waving a small Australian flag, keep your camera pointed towards them for a while and take a few shots. You may not realise it at the time whether you’ve captured an interesting facial expression, so the trick is to keep shooting. Travel photographers use a range of lenses, however some prefer to use one camera and one lens when photographing an outdoor event. By doing so, it allows you to concentrate on the subject matter and be less concerned with equipment. Zoom lenses in the range of 70-200mm are a popular choice as they provide versatility whilst walking around. Depth of field is a major factor and the best photos tend to be those which are taken with a shallow depth of field. Anywhere in the range of f/2.8-f/5.6 seems to produce pleasing results. A wide-angle zoom is handy if you can position yourself close to the action. You can produce dynamic portraits by moving in close and using a wide-angle setting. A second camera body is ideal as it can eliminate the need to changing lenses. If you use one body only, it may be best to use a lens in the range of 70-200mm. I prefer to keep camera settings simple for these types of events. I use aperture priority, set the aperture to f/4, and adjust the ISO as conditions change. 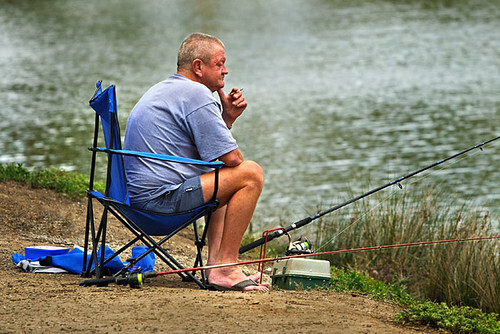 Outdoor events generally allow for shooting 100-400 ISO, with preference given to shooting an ISO as low as possible. Shutter speeds are critical for sharpness, and my preference is to shoot at 1/500sec and faster. 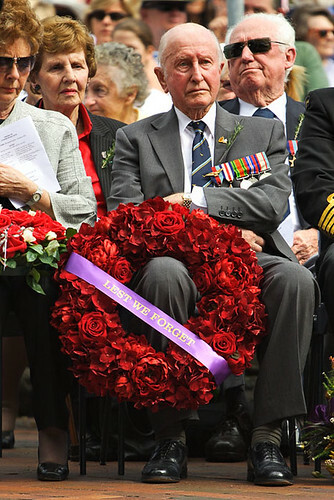 Finding the ideal positions to photograph people at Anzac Day processions can be difficult, however the most important advice I can offer is to keep the sun at your back. This will help alleviate sun flare in your photos, blown out highlights in the background, and dark shadows on faces. 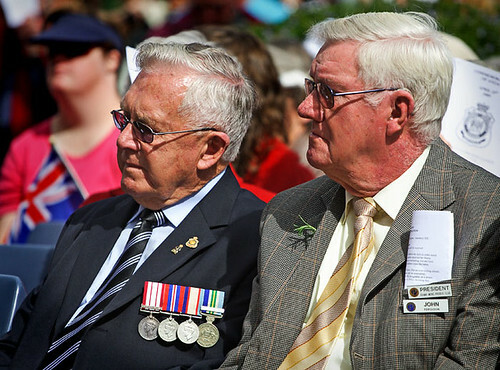 Anzac Day is a day of reflection, and is probably Australia’s most patriotic day. My experience is that people are not surprised to have their photograph taken on this day when attending events. Be respectful and acknowledge someone if you make eye contact. A nod of the head and brief smile will put people at ease. 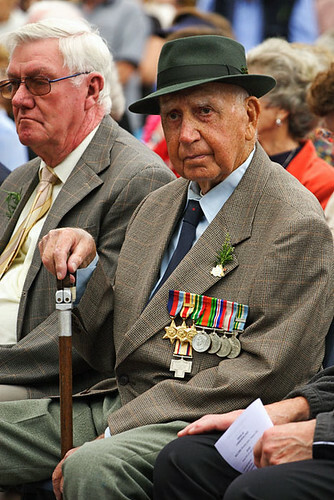 Wear an Anzac badge and do your best to blend in with the crowd. Lest We Forget. 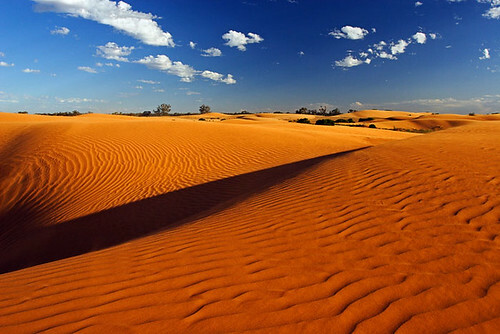 I'm thrilled to have my various articles and travel photography published in Discover Australia magazine Issue 1: March 2010. 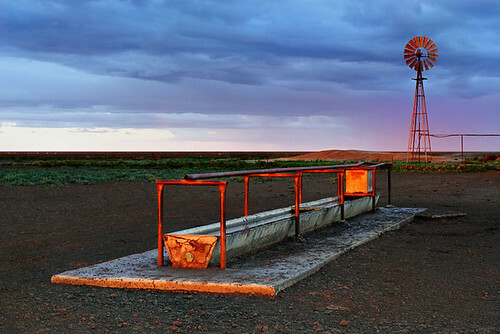 The magazine is the official magazine of the Australian Travel Photography and Writing group which has 766 members. As founder, host and journalist of the Australian Travel Photography and Writing (ATP&W) group, I'm pleased to see this free publication come to fruition as it's providing a rare opportunity for budding and experienced Australian travel writers and photographers to showcase their skills, and inform a worldwide audience of Australian travel and tourism experiences. Discover Australia Issue 1: March 2010 is available for viewing in PDF format via the following link and by clicking on the front cover graphic below. The publication can be saved to your computer and shared with family and friends. The magazine has an appointed volunteer editorial team consisting of: Leanne Nelson, Editor; Darren Stones, Journalist; Susan Adey, Deputy Editor; Nerida Smith, Assistant to the Editor. Their responsibility is to publish the magazine, seek and provide quality content, seek interesting and informative travel writing from group members, search for and seek quality travel photography from group members, communicate with contributors, conduct a photography competition, arrange sponsorship, and promote the magazine via email, and various websites including RedBubble, Facebook and Twitter. I had the vision and concept for the magazine, and with the support and dedication of the editorial team, and contributions and support from members of the ATP&W group, Discover Australia has become a reality. The magazine has impressed many people and they have kindly expressed their thoughts in writing within the Australian Travel Photography and Writing group and other areas on the internet. 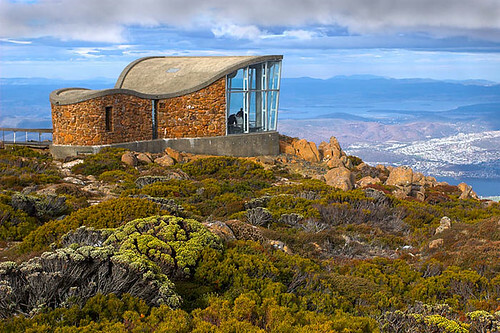 Greg Barton, Editor, Australian Traveller magazine - which is Australia's best-selling travel magazine - has described Discover Australia as "Top Stuff!" Greg was appointed as Patron of the ATP&W group by me in May 2009. Enjoy reading Discover Australia Issue 1: March 2010. I sure enjoyed being part of the first issue.